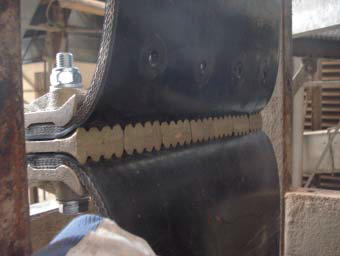 There are two general types of belt fastening methods: mechanical fasteners (as pictured below) or hot/cold vulcanising. As material in a Bucket Elevator is not carried by the belt, it is not necessary to vulcanise the belt together, so it is common for Elevators to have mechanical Belt Fasteners (also known as belt splices). There are various different types of mechanical Belt Fasteners, and Skilled Materials Handling has the experience to ensure you get the best one for your Bucket Elevator.